Using les hardware than traditional frame models, this carefully designed frame tent by Celina is equipped with highly durable galvanized steel poles. In addition, the top cinches tightly over the frame to provide a tidy appearance. 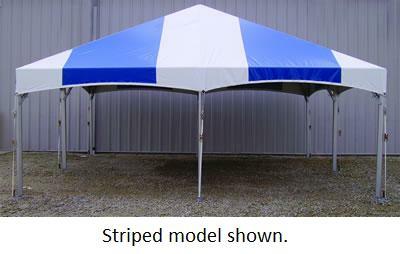 It is made of 16 ounce vinyl and over 94% of the top is bonded with heat sealed construction. The side curtain rope that is included is secured with one inch polyester webbing that sewn approximately every 15 in around the boarder of the tent.